We love Walmart! Nothing like spending $1.88 or $2.88 on things that are usually $10.00. But, the one in Bowie stinks. We have been waiting for the new Supercenter to open in Glen Burnie. It opened this week and we went tonight. 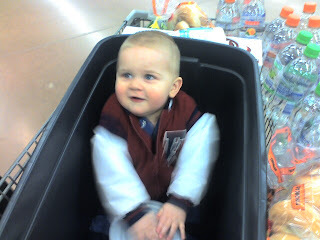 Here is a picture of Davis in the cart. We had a blast playing in the Tupperware bins. I spent the whole day with my little man. I cherish Fridays! Especially on weeks like this where I work too much. Tricia's sister, Melyssa flew in from Miami tonight. She will be with us all weekend.